Metabolic syndrome is a combination of risk factors that increases your risk of diabetes, heart disease, stroke, and early death equal to the risk of long-term smoking. High blood pressure, elevated blood sugar levels, and being overweight are problems by themselves. When you add them together, the risks are multiplied, and you have metabolic syndrome. High blood pressure (130/85 or higher) or are on blood pressure medication. 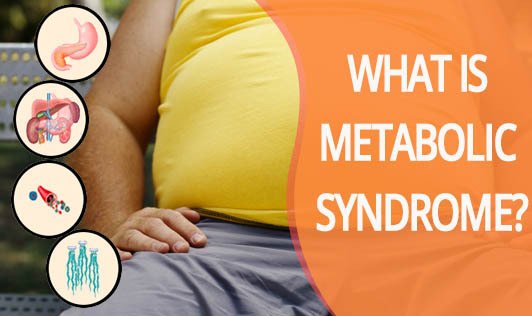 Having metabolic syndrome puts you at higher risk for diabetes and congestive heart disease. Weight loss and regular, moderate physical activity plus treatment for individual risks - is the best way to lower risk of metabolic syndrome and prevent serious health problems. Achieve and maintain a healthy weight. Losing just 5-10 % of your body weight can greatly reduce the chance that metabolic syndrome will evolve into a more serious illness. Be physically active. Taking a brisk 30-minute walk daily can result in weight loss, improved blood pressure and cholesterol levels, and a reduced risk of diabetes. Improve your diet. Focus on a plant-based diet, including legumes (e.g., beans/ pulses or lentils), whole grains, fruits, and vegetables. These foods are high in nutrients, fiber, and complex carbohydrates. Avoid refined foods like white bread, white rice, cookies/ biscuits, crackers, and sweets. Reduce your intake of meats. Use healthy fats found in avocado, nuts, and oils (e.g., canola, peanut, sesame, safflower or olive).